I have a thing about gas stations while traveling long distances on a motorcycle and I suspect it’s more than just worrying about running out of gas. I’ve developed a greater appreciation for them over the years. They’re like small oases on long rides, a place where you can get the fuel to keep going and a small comfort for yourself, like ice water when the weather is hot and hot chocolate when it’s cold. My fascination with gas stations started when I was living in Reno, Nevada, and was planning to visit my favorite uncle, Robert, my motorcycle guru, in San Diego. That’s about 600 miles and I was on Discovery, my 750 Yamaha Virago so I carefully calculated the distances between towns on U.S. 395 prior to leaving. The Virago has a 4-gallon gas tank so I plotted things accordingly. I took U.S. 395, one of America’s most underrated highways. It’s a lonely road with towns far apart, but it passes through scenic deserts, stark and beautiful. It’s an exhilarating ride on a bike. I made that trip many times during my stay in Reno and I got to know exactly where to fuel up. I knew that I could leave Reno, enter California and fill up at the Chevron in Bridgeport, and again at the Texaco on the southern outskirts of Bishop, or keep going to the Shell in Independence. From there it was the Texaco in Olancha, with the odd Quonset hut on the east side of 395. Then the Shell station at Kramer Junction, at the intersection of 395 and California 58. Now you can keep going until you hit I-15 in Hesperia. The population is denser and there are gas stations everywhere. 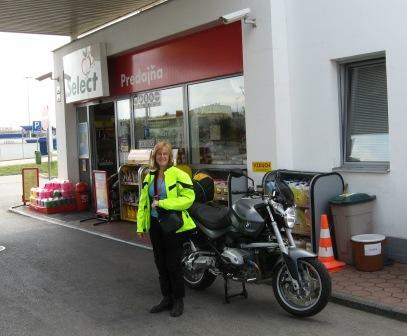 Most of the roads we rode in Slovakia and Hungary were more lively than 395 but the gas stations felt about the same. Maybe motorcycle riders appreciate them more. They get a mention near the end of the documentary Long Way Round. Every so often I wonder about the Quonset hut Texaco in Olancha, Calif. I should go back there and see it. It would be a good ride.